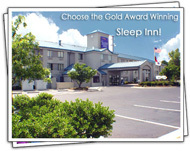 Sleep Inn Wilmington is a three-story hotel located in the middle of historic Wilmington and just three miles from Wrightsville Beach and four miles from the Thalian Hall Center of Performing Arts. It is not far away from the University of North Carolina - Wilmington, the International Airport and the USS North Carolina Battleship. All the guest rooms are well equipped and feature cable TV, free local phone calls, complimentary high speed internet access as well as a free complimentary continental breakfast. There is also an outdoor swimming pool and fitness center.